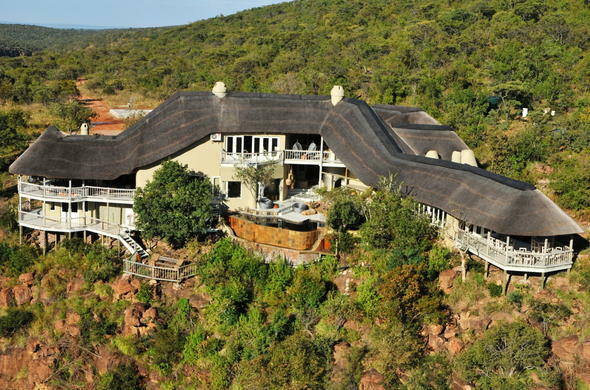 This elegant and world class lodge is situated in the Welgevonden Private Game Reserve in Limpopo, South Africa. Clifftop Exclusive Safari Hideaway is a remarkable 5 star Limpopo lodge and bushveld retreat, where the highest standard of living is a natural way of life. Understated elegance and world class luxury makes staying at this Limpopo safari lodge a memorable experience. With a breathtaking setting, Clifftop Exclusive Safari Hideaway provides a beautiful African backdrop for the ultimate safari experience in South Africa. The Welgevonden Private Game Reserve is situated just 2-and-a-half hours by road from Johannesburg and is a malaria-free destination. Welgevonden has grown to be one of South Africa's premier private reserves. Due to the careful and caring management and excellent game location, this area is home to Lion, Leopard, Elephant, White Rhino, Cheetah, Brown Hyena, 15 different types of buck and 30 other species of mammal.